Ross County co-manager Stuart Kettlewell insists he has no regrets over fielding a much-changed side which lost 4-1 against League 1 side Arbroath in the Betfred Cup last week. 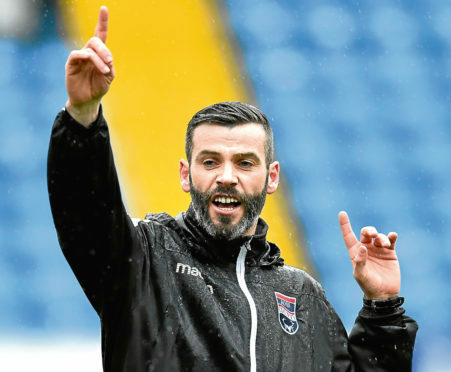 Kettlewell and fellow co-manager Steven Ferguson made six changes for the trip to Gayfield, where 10-man Staggies were stunned by their part-time opponents following the dismissal of Tony Dingwall. County responded well to the setback, with Saturday’s 2-0 win over fellow Championship side Alloa Athletic clinching top spot in Group A and setting up a second round tie away to top-flight side Hibernian on Saturday, August 18. With County winning three of their four games in their section fixtures, Kettlewell is refusing to get carried away by the defeat to the Red Lichties, and feels the group campaign has set the Highlanders up well for the start of league action at home to Alloa on Saturday. Kettlewell said: “We’re trying to create a healthy competition where you’ve a burning desire to play, but if your team-mate gets ahead of you it then flips on it’s head and we’re pushing each other all the time. “That’s what we’re looking for. No club is going to play the same eleven for 36 games. It is such a demanding league. “Throw in cup games as well and it is going to be a squad – everyone will be called upon at some point. How much, you don’t know – that will be down to form and injuries. “But that’s where we’re not getting caught up in the mass hysteria of one result. We’re going to call on the entire squad across the full season. “That’s where it gets lost in certain quarters. “We’re not just throwing away a game of football and going out to lose a game. But we need to be in a situation where everyone is in a position where we can trust and rely on them. “The only way to do that is by trying to get them on the pitch at some point. That’s why we went through the process we did in the four League Cup games. While the trip to Easter Road promises plenty excitement, Kettlewell is concentrating on league matters in the meantime, with the league opener against the Wasps followed by a trip to Dunfermline the following week. He added: “Away to Hibs is always a great venue to go to but I’m probably a wee bit different from everyone else. I’m not one of those people who sits around the television and bites my nails. Whoever you get, you’re not going to change that.